It’s been more than curious to watch the backlash from the comedy community and “comedy nerds” against Whitney Cummings and her new NBC sitcom, Whitney, which debuted last night to an audience of about 6.7 million viewers. Reaction from TV critics has run the gamut from loved it to really hated it. I’ll post my own review next week. And executive producer Betty Thomas threw a little bit of hate back at the haters in this TV Guide interview. For casual viewers, though, they may have just wanted to know a little bit more about the show and who these comedian/actors are. They may have seen Cummings on a Comedy Central roast or two in the past couple of years. 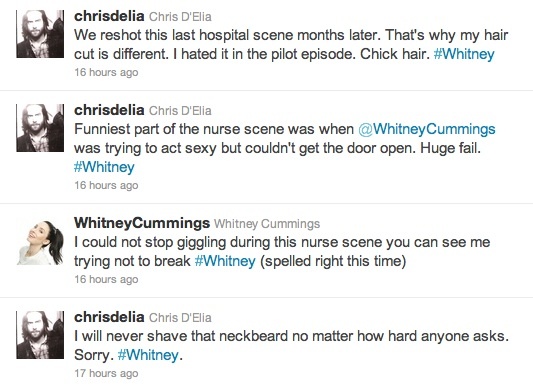 Or maybe they’ve only seen her and co-star Chris D’Elia in the seemingly neverending barrage of promo clips, bus/train/subway signs and billboards touting Whitney since NBC picked up the series at the start of the summer.